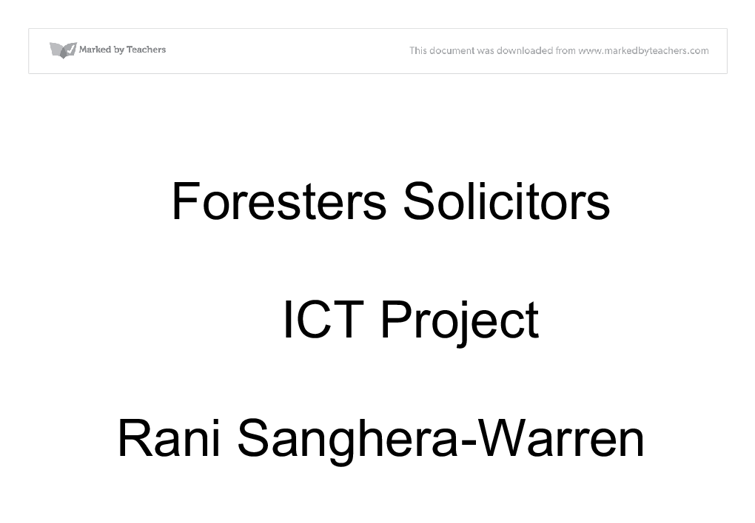 Foresters Solicitors ICT Project Rani Sanghera-Warren Table of Contents 2 1 Introduction 3 2 Specification 4 3 Implementation 10 Choice of Software 4 Testing 12 5 Evaluation 14 6 User Documentation 15 1. 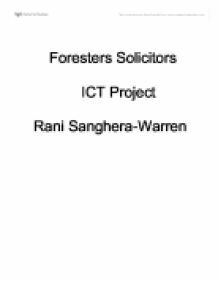 Introduction The End User The end user for this project is a solicitors firm called Foresters. There are four solicitors working in the office, one trainee solicitor and a receptionist, they all have access to there own computers and they all need access to the diary/log book, filing cabinet and other information. They require a scheduling piece of software to be used by all the staff. It will be used to look up information on clients, staff and prisoners and will also work out the release dates for individual prisoners. The system in place The system the company currently have in place is a simple paper based system, so, for example if a the company took on a new client they would have to rite the clients details on a 'client form sheet' and put it in the companies folder in the filing cabinet, all the records are then sorted alphabetically. A lot of time is spend ensuring this is done correctly, and this system has a lot of room for error, if the staff are tired or in a rush mistakes are easily made and this then causes great difficulties in the future when that member of staff is looking for the clients records. The possible systems that could replace the old one are: 1. A spreadsheet where the end user will be able to input and view data. 2. An interface where the end user will be able to input and view data. 3. A user form where the end user will be able to input and view data. The problem with the current system There are clear disadvantages to using this system, for example: * Information can be easily lost or misplaced If this happened it could result in problems such as missing release dates etc. ...read more. is performed automatically, end sum is right Implementation Before I started my project I had to collect data from my end user, the data from Foresters included information on clients, staff and prisoners. Once I had this data I was able to start my project. Staff Data The screen shot above shows a list of Staff names and their contact details in a spreadsheet in Excel. This information is what is displayed below in the actual interface. This is where the data above is shown, on the opening screen. Client Data Above is a list of all the client details that Foresters gave me. This includes their names, addresses, contact numbers and legal information such as when they are next due in court. This information was then shown on the client details screen on the user form. To do this I had to do an advance filter, to filter threw all the reference numbers of the clients sp that specific clients could be recognised. Client form- Advanced Filter Once I had got my data into a list, I started creating a user form but before I could carry this out I had to run an advanced filter. An advanced filter searched threw all the data to find, and single out the piece you want to view. To create an advance filter I first had to copy the column headings in to three separate areas leaving enough space between each so that the required amount of data could be displayed (like below). Once I had made a criteria range i.e. copied the headings to two other separate places, I had to run a filter with once client from the client details sheet. Too do this I when to 'Data'/'Filter'/'Advanced Filter' the picture below illustrates what will then appear on the screen. I then made a macro which recorded the advanced filter. Once I had recorded the macro I found it in visual basics and matched the field source to clients on the spreadsheet and then entered this formula (below) ...read more. Here you can see a list of all the staff details and two buttons leading to client information and a prison list. If you decided to press client information a form like this will then appear. Use the drop down box on the right to select the client you are looking for, once this is done all the other boxes will be filled automatically as shown below. Once you have finished viewing this information click close to go back, then you can select 'Prisonlist' you will then be show this screen. You then select the prison you would like to search for prisoners in, for example you may want to click onto 'Belmarsh' in which case you will be redirected to this form. All four of the prison forms are identical to the one above. Once you have selected the required prison you then select the prisoner you're looking for by their surname and all the other text boxes will be filled automatically. Finally when you are finished viewing all the information you simply press the close button, and then press it again on the main form. Glossary of technical terms A B C D Desktop Dialogue box Drop box The background behind all your windows, menus, and dialog boxes, your virtual desk A special window used by computer programs or operating systems to display information to the user, or get a response if needed A user interface control element which allows the user to choose one value from a list. E F Filtering Form G H Hyperlink I Input Interface Data that is entered into the computer threw some sort of device A hardware and software link that connects two computer systems J K L M Macros Mouse click Mouse press Module testing Testing there v lookup buttons N O Output R R.M.B U Unit testing ?? ?? ?? ?? Rani Sanghera-Warren Set 4 AS report rani2 - 36 - ...read more. This may just be a local newspaper or could be a national or even international. This will help cuckoo games get recognised and can help with the reputation of the company. Using the local media to do a page on your business will help to build reputation and encourage customers to check out your website. He will also be able to organise data in an easily readable fashion. He can do this by changing the colours of certain cells to match certain data, or group certain cells together. This will all be included within the template spreadsheet. and face-to-face (this will be used in important and confidential situations). Feedback is the response/ reaction; these may either be verbal while other requires a written answer. Feedback will indicate how the message has been interpreted and whether it has been understood. These records should be deleted. 6. Processed in line with the rights of the individual. Each individual customer of transactional website has the right to privacy, and all data has to be processed with this principle in mind. 7. Kept secure. The font size also remains consistent in the main body of the text. There are instances where the font style changes to another readable font, for example Arial. This is when the topic of the article shifts, from a health issue to a youth scheme. These different processes are activated by any person who types into our forms and who clicks the submit button on the website. Each of these processes will be tested by putting a different input into the Contact Us form such as "Hello".